WE ALL know BMW’s S 1000 RR is one of the most potent sports bikes on the planet, and it’s dripping with technology. BMW realised it was missing out on customers though, the ones who wanted the engine of the RR but with a more real world ability. And so the S 1000 XR naked bike was spawned. A retuned engine made it better at lower to mid range speeds and the riding position was much nicer on the body. But we all knew the bike to sit between the two was a sports touring sort of bike better suited to coping with Aussie conditions. The writing was on the wall and finally BMW built the bike, a bike which to be honest is so good it has basically no peers in the environment it was designed for. 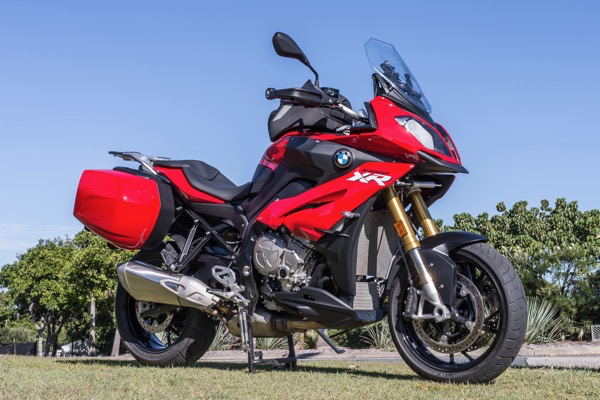 BMW is calling the S 1000 XR an Adventure Sport motorcycle but BMW is also quick to say it’s no adventure bike. In other words it’s no GS with an inline four cylinder engine. In the right hands this bike is insanely quick on back roads. It has the suspension and the engine to embarrass most other machinery. Realistically not many manufacturers are making a bike to seriously take the S 1000 XR on in its natural habitat, but bikes like the latest Ducati Multistrada 1200 can. Of course that’s comparing apples to apples with the same rider, and it would come down to what you prefer as in brand rather than the actual ability of the motorcycle. 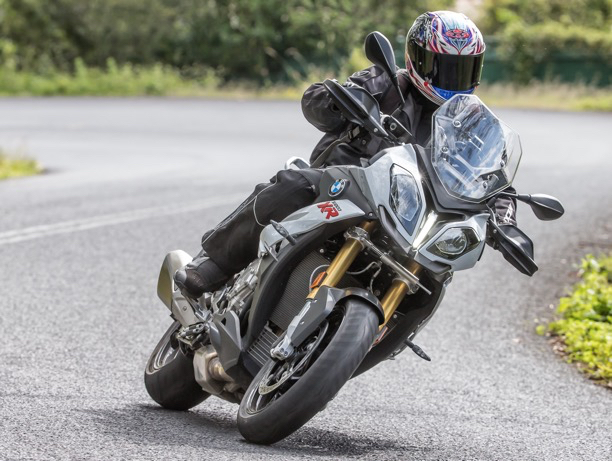 The engine package is essentially the same on the S 1000 XR that’s found in the naked S 1000 R. It’s been retuned from the RR version, so now has 160hp (118kW) at 11,000 rpm and maximum torque of 83 lb-ft (112Nm) at just over 9000 rpm. The retuning has made it possibly an even faster real world engine than the RR engine with 40 more ponies running rampant. By the time the 200 ponies lift their skirts, the 160 ‘retuned’ ponies have already bolted. 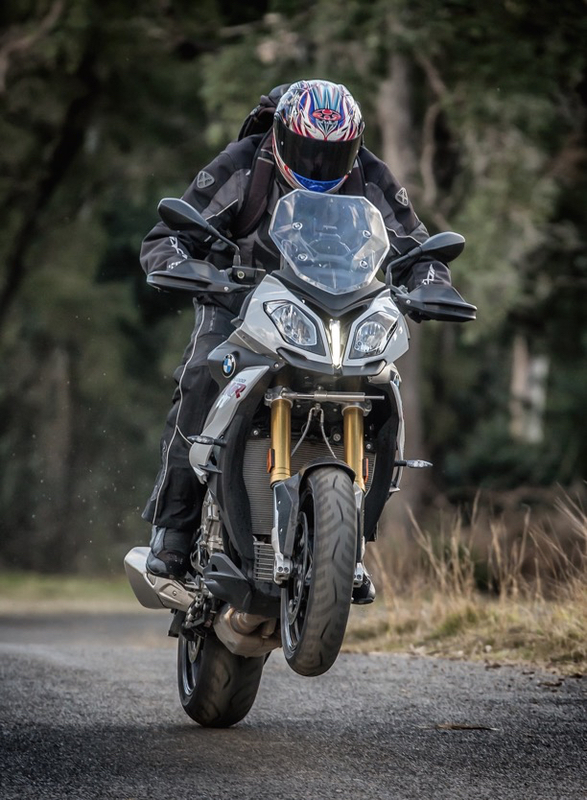 All Australian delivered S 1000 XRs will come basically fully loaded with regards to suspension and electronic rider aids. So it gets ABS Pro, which works even as the bike is leaned, Automatic Stability Control (ASC), Dynamic Traction Control (DTC), which comes as part of the optional Pro riding modes. There’s also electronically controlled suspension, Dynamic ESA, which allows you to adjust the suspension – yes it’s a separate thing – plus riding modes and more. There are optional extras also but standard the bike comes highly equipped. In standard trim the S 1000 XR comes with two riding modes, Rain and Road, but if you purchase the optional ‘Dynamic’ package for $1,375, you get DTC, Gear Shift Assist Pro (quick shifter), Riding Modes Pro, ABS Pro, Cruise Control and LED indicators, phew, you get access to two other riding modes, Dynamic and Dynamic Pro. As with pretty much every other rider aid system built, the further you go up the performance chain on the XR, the less intrusive the rider aids become. I won’t go into each and every accessory because there is quite a few, from touring to performance and bling, but the other main optional package available is the Touring Package where you get Dynamic ESA, the attachments for a GPS, a luggage grid and case holders. You can of course decide not to buy any of this and go with the base model but if you want to retrofit any of these options at a later date it will cost you more than if you ordered it from new. If you unleash all the power this has and go with the least amount of electronic intervention you will be heading towards the horizon at an alarming rate. This bike has so much stonk off the bottom it’s fun with a capital FAAAAARK! Thank the stars it has the brakes and the suspension to match it. The suspension isn’t built for racetracks, it has decent travel designed for our crap roads, but it’s still on the soft side of sport. I found the suspension hard to fault really, whether it be when the bike is rolling and the electronics are doing their job or when you are adjusting the pre-load settings. It all just works as it should. Nothing is perfect of course but as an all-round package theS 1000 XR is pretty right. I loved the engine for it’s usable power, and it’s this sort of power that makes it more fun on the road than the RR’s powerplant. Of course they are very similar but while the RR keeps going after the XR has signed off it’s in territory most riders will never be on the road. The engine gets a ‘buzziness’ to it around 4000 rpm but it’s nothing that’s unpleasant. The gearing is shorter than I expected too. I guess it’s part of the ‘real world’ aspect to the bike and to be honest I probably wouldn’t bother changing it. Top speed is around 250 kilometres, or so I’m told, so the short gearing no doubt plays a part in this too. I found the seat could be better for me. Maybe I have a weird arse, I’m not sure, but I have sampled better seats. I’d also go for the tall seat option not just for the height aspect but for the shape of the seat, which I’m sure would make my backside happier. Besides being a cool looking jigger in an apocalyptic sort of way, the whole fairing thing works fantastic. The manually adjustable screen works a treat with minimal buffeting, and you can hear the engine clearer when the screen is fully up. You get plenty of protection from the elements too, and after jumping on to the S 1000 R naked bike for a while on the launch I found the side fairing pieces on the XR actually worked. I could easily live with the S 1000 XR. In fact I loved it. This sort of bike is tailor made for Australian conditions, and the level of inclusions it has for $22,190 + ORC makes it competitive price wise with any bike it would go head to head with.